Jay Hawkins wasn’t called “Screamin’” for nothing. Outlandishly dressed and carried onstage in a casket, his operatic screams and moans during his only hit (the classic “I Put A Spell on You”) tapped into rock and roll’s early energy. This equally energetic and freewheeling historical fiction follows the arc of his life: an African-American adopted by a Native American family, conservatory student, WWII veteran, boxer, and finally, performer with one hit to sustain him. Hawkins, to the concern of other black musicians, seemed to embrace the caricature of white America’s fears of black men. Hawkins didn’t experience respect when he was alive, but his classic song has been recorded countless times since his death. Binelli, a reporter for Rolling Stone, is the perfect medium to conjure this larger than life, supremely fascinating, and ultimately tragic individual. He came on stage in a coffin, carried by pallbearers, drunk enough to climb into his casket every night. Onstage he wore a cape, clamped a bone to his nose, and carried a staff topped with a human skull. Offstage, he insisted he'd been raised by a tribe of Blackfoot Indians, that he'd joined the army at fourteen, that he'd defeated the middleweight boxing champion of Alaska, that he'd fathered seventy-five illegitimate children. The R&B wildman Screamin' Jay Hawkins only had a single hit, the classic "I Put a Spell On You," and was often written off as a clownish novelty act -- or worse, an offense to his race -- but his myth-making was legendary. In his second novel, Mark Binelli embraces the man and the legend to create a hilarious, tragic, fantastical portrait of this unlikeliest of protagonists. Hawkins saw his life story as a wild picaresque, and Binelli's novel follows suit, tackling the subject in a dazzling collage-like style. At Rolling Stone, Binelli has profiled some of the greatest musicians of our time, and this novel deftly plays with the inordinate focus on "authenticity" in so much music writing about African-Americans. 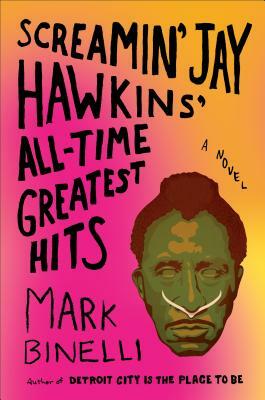 An entire novel built around a musician as deliberately inauthentic as Screamin' Jay Hawkins thus becomes a sort of subversive act, as well as an extremely funny and surprisingly moving one. Mark Binelli is the author of "Detroit City Is the Place to Be" and the novel "Sacco and Vanzetti Must Die!" as well as a contributing editor at "Rolling Stone" and "Men's Journal." Born and raised in the Detroit area, he lives in New York City.